The cult of Huy Fong tends to scream all over the Internet whenever any new Sriracha development hits, and now we know why: they're all jacked up on testosterone. 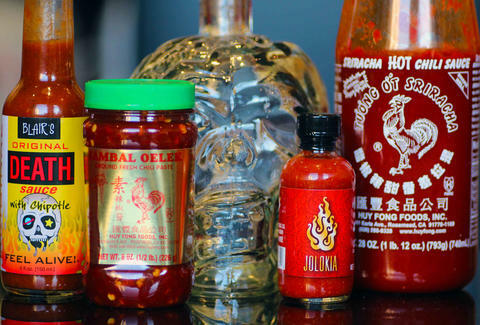 New research out of the Physiology & Behavior journal reveals that men who opt for hot sauce have higher testosterone than dudes with milder tastes. You can read all about it in the study titled "Some Like It Hot", because even stuffy scientists can't help themselves. The experiment enlisted 114 guys between the ages of 18 and 44. The University of Grenoble researchers first polled them about their feelings towards spicy foods, then served each dude a plate of mashed potatoes. They were allowed to season with either salt or hot sauce -- and the team found that the guys who used more hot sauce tended to have higher testosterone levels. On the flip side, they concluded there was no relationship between amount of salt used and testosterone. Since high testosterone is already associated with risk-taking behavior, these findings aren't all that surprising. But just to be safe, don't get into any scraps with the dude who has a private stash of ghost peppers -- he's probably Teddy Roosevelt reincarnated. Kristin Hunt is a Food/Drink staff writer for Thrillist, and can live with not being an alpha dog. Follow her to black pepper and Old Bay at @kristin_hunt.